"Passersby stop to look at the damage caused by a fire to the First Parish Congregational Church on February 21, 1909. The fire partially destroyed the stone building and 'brought genuine grief to the townspeople, as well as to the men and women of the First Parish.' Sunday worship services were held in the Town Hall (on Main Street at the corner of Water Street) as well as at other churches in the community during the three years the First Parish was without a home of its own. Rebuilding began soon after the fire, and the new church, much like the old, was dedicated on February 1, 1912." -- Text from calendar by Jayne M. D'Onofrio. 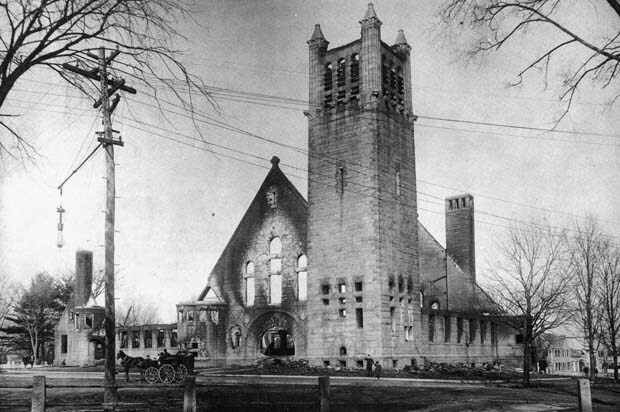 “First Parish Congregational Church, February 1909,” NOBLE Digital Heritage, accessed April 22, 2019, https://digitalheritage.noblenet.org/noble/items/show/6943.